GNU Health Con is an annual conference that brings together enthusiasts and developers of the Free/Libre Health & Hospital Information System. It hosted in Las Palmas de Gran Canaria, Spain on November 23rd until 25th. I met the people behind the project during the openSUSE conference 2018. Since I'm health professional, this projects fits me. So I introduced myself to the community and started to write some articles and translate in Greek. I didn't have in mind to join GNU Health Conference by that time. I just liked the project and wanted to contribute. The idea to attend came after summer, during another conference. GNU Health is sponsored by openSUSE. So openSUSE planed to be there both with a presentation and a booth. 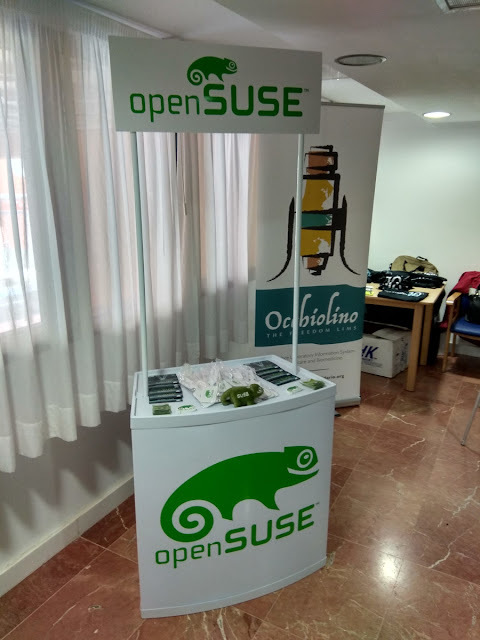 I would like to thank openSUSE sponsoring me to attend to such an awesome conference. My Odyssey for me started going from Thessaloniki to Hamburg (about 3 hours flight) and then Hamburg to Las Palmas (about 5 hours flight). I arrived just before midnight and the weather was rainy. Heavy rain. I didn't feel it much because I was exited to attend the conference. The first day of the conference there were couple of interesting presentations such as Digital Health: Health for all by Tomas Karopka, Patient information governance standards by Dr Richard Fitton where he talked about the GDPR, Orthanc: Free ecosystem for medical imaging by Sebastien Jodogne, a project that is very useful even to veterinarians. I liked Isabela's presentation about Privacy and security of your health information. She introduced us to Tor project and mission. A cool thing I learnt there was the facebookcorewwwi.onion (it allows access to Facebook through the Tor protocol) and onionshare (an open source tool that lets you securely and anonymously share a file of any size). Ghazal Hassan explained what it's happening in Morocco. The title of his presentation was Challenges in health data management in low-income countries. The day closed with Ludwig Nussel presenting openSUSE Leap and Tumbleweed an overview. The feedback was very positive on openSUSE. 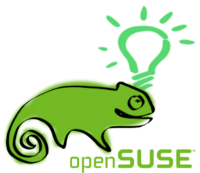 Many implementations are on openSUSE and the guys that use it, they say that it's very stable system even they have some obstacles to overcome on infrastructure. The day closed with a round table about open source on health. A conclusion that came out from this talk is that we have to document everything we do, so more people can use our product. 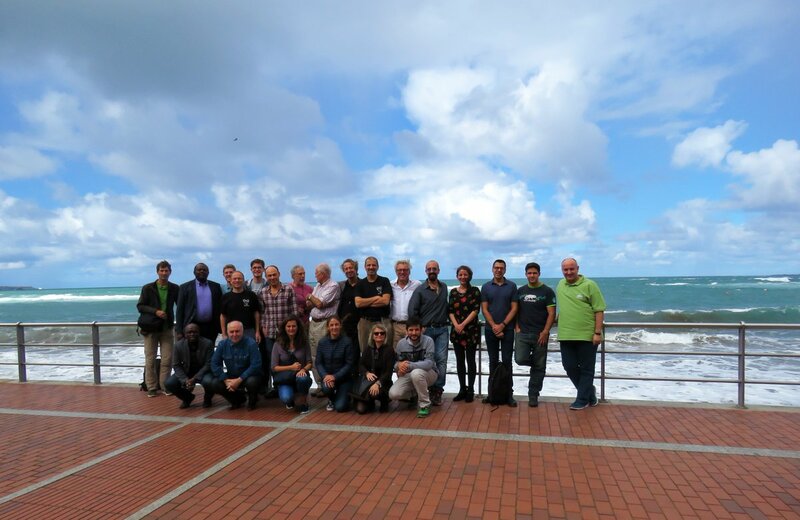 During the coffee break, we had our group photo. The second day started with Axel Braun talking about the community followed by Vincenzo Virgilio that analyzed what is happening with migrants in Italy. It's something that it's happening in my country also and it's important to have a managing health platform for immigrants. Armand Mpassy-Nzouma analyzed how you can manage a project with GNU Health. He made a quite funny and inspiring talk. My friends from Argentina, Ingrid Spessotti and Francisco Moyano Casco talked about Diamante health information system. Francisco mentioned that they use Pentium 4 as servers. It's an example that if there is no money for technology, use what ever you have at the time. Emillen Fouda talked about the impact that GNU Health has at the Bafia District Hospital. 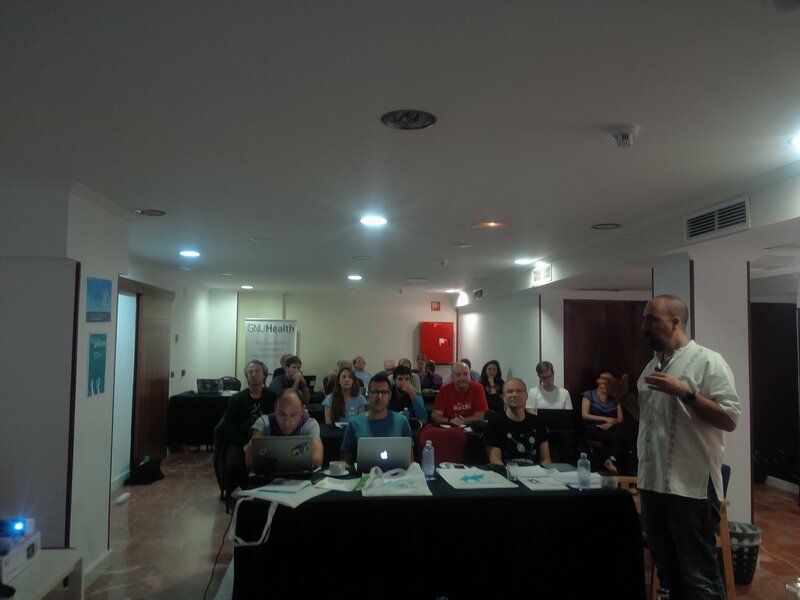 Closing the day, Luis Falcon introduced the book of life and the GNU Health Federation. The day ended with GNU Health Social Medicine Awards 2018 and a dinner at a fancy restaurante. Sunday was the last day of the conference. Actually it was workshop day. There was a demo of the federation and also the command line. Personally, I helped at the booth, although there were not countless attendees. We had a pretty cozy booth. People got swag and asked questions about Leap and how it's connected to SUSE. My experience was unbelievable. I'm very happy that openSUSE community supports a fantastic "health and healthy community". Usually doctors aren't that enthusiasts when it comes to conferences. But if you mix with open source, you get a hybrid. I can't wait to meet you again guys. Maybe FOSDEM, maybe next conference. Here is a vlog (in Greek) about my trip to Las Palmas and the conference.